Landscape: Eastern Viti Levu is hilly with rainforests, large rivers and pastures for the thriving dairy industry. The city of Suva, the capital of Fiji is located on the south-eastern corner. Visited: October to December 2004, and several more times until July 2005. 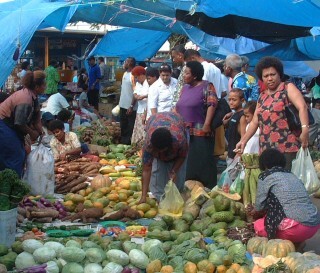 (Sue) Suva is a vibrant city of over 170,000, with a wonderful mix of cultures. We feel like we're in Asia, with the women in saris, the men in sarongs, and the smell of Chinese spices and Indian curries wafting from the hundreds of tiny restaurants. Unlike French Polynesia where we couldn't afford to eat out, we indulged in "saving money" by eating out very often. Under $5 for a wonderful meal of curry, rice, and dahl. The saying goes that if there's something you want and it's not in Suva, it can't be found in Fiji. We had a great time testing the truth of this statement in our endless search for things needed for the boat or our ever questing palates! I not only loved the city but loved seeing the countryside around it. 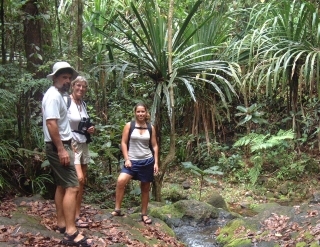 Just 15 minutes (by car) up into the hills is the Colo-i-Suva (Tholo-ee-Suva) rainforest park. 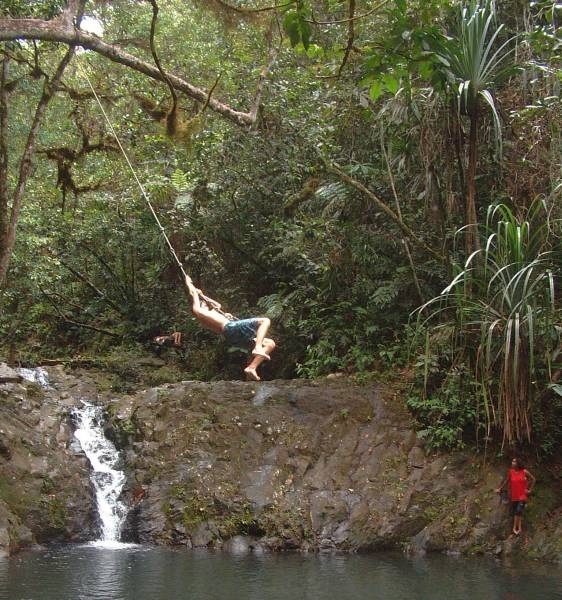 We spent hours wandering the trails, then cooling off in the pools formed by a mountain stream. 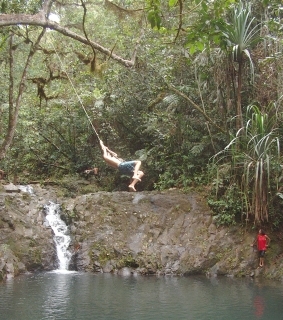 Chris was the adventurous one who had a blast on the rope swing, dropping into the lower pool, whose depth is unknown. 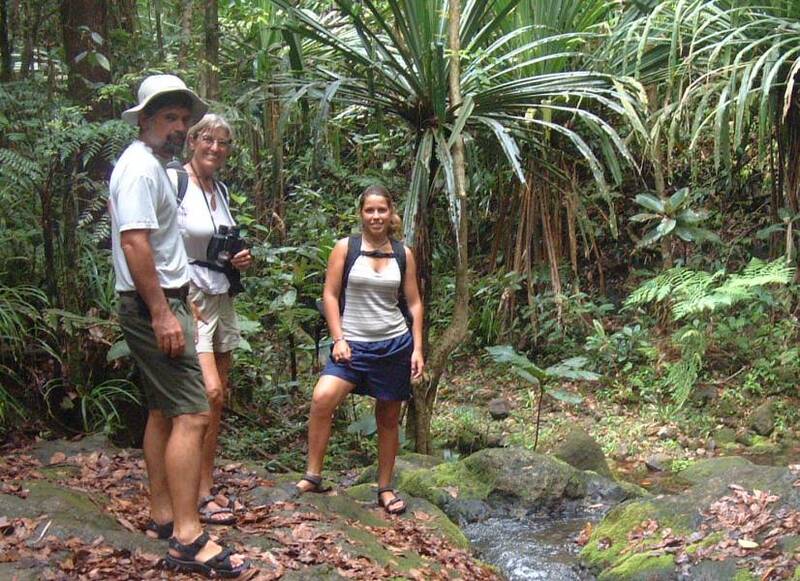 The rainforest was not as lush as those of the Caribbean or South America, but still hosted a variety of ferns, tree ferns, ficus trees, mahogany, and other new forms of tropical hardwoods. As usual I was on the lookout for birds, but forests are particularly difficult places to see them. The calls and chirps were enticing even though I couldn't identify a single bird! 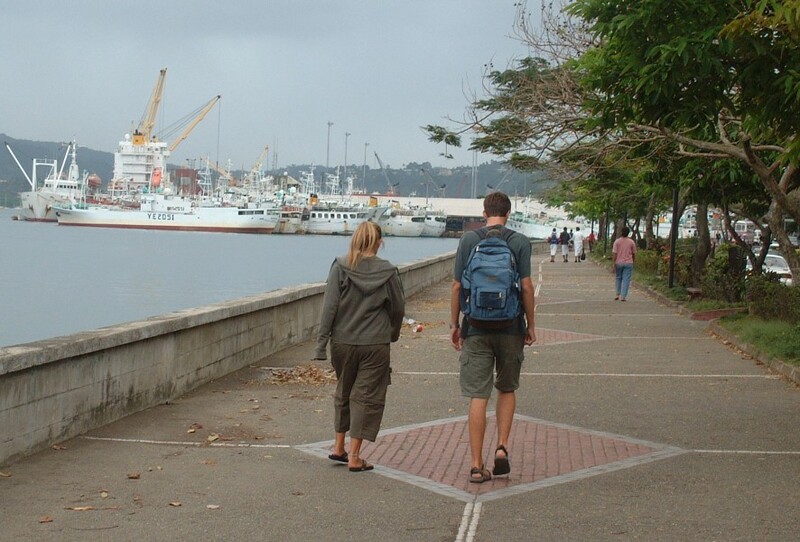 (Amanda) We sailed to Suva three times during our year in Fiji, and each time was punctuated by different motives and activities. At first, Suva was just a (relatively) large city full of supermarkets, small stores, interesting places, and new places to see. After a month or two though, it just got better. We discovered the Republic of Cappuccino our first day in town, and sampled their exquisite iced mochas and fruit smoothies entirely too often during the sweltering Fiji summer. Later on they got a wireless internet connection that was free for customers, and we seemed to spend even MORE time in there. Mom and I, for those who don't know, have a tendency to become movie freaks whenever possible, and Suva definitely provided an opportunity. Their large (again, relatively) 6-screen cinema gave us many hours of amusement and off-boat time. A bonus was the movie tickets being a quarter of what they've become in the States, and also the air conditioning in the theaters occasionally being so strong that we needed long sleeves! We were also in Suva right before Christmas, which gave us the excuse of wandering all over town looking for things to buy. A popular poster on store-fronts and in catalogs for some big stores was one with a picture of Santa. Not unusual. But this Santa was black, had dreadlocks, and looked ridiculous in his big red suit in the middle of summer. We had a good laugh over that several times. For Christmas shopping we went up to the Indo-Fijian streets, where there were lots and lots of small shops and everything was inexpensive compared to the larger brand-name stores on the front streets. The cloth, sari, and clothes shops seemed cute and authentic, and of course seeing all the Indo-Fijians in their saris and beaded tunics and such was always a treat. (Jon) The normal Suva anchorage is off the Royal Suva Yacht Club. This is close to town but is a fairly bleak anchorage, often downwind of the highly odiferous dump. Therefore, we usually went further into Suva Bay and picked up a (free!) mooring off the Tradewinds Hotel. The anchorage was very protected and pretty, and the hotel staff were very friendly, letting us use the swimming pool and pool tables, as well as calling us taxis whenever we wanted to go to town. Suva bay is full of rather decrepit far-eastern fishing trawlers. In fact, the reefs leading into the bay are lined with wrecked fishing trawlers. But one ship at anchor stood out from the rest, and when I looked at it through the binoculars I realized it was a cable-ship. So I called them on the radio and organized a tour, which was very interesting, especially the history of undersea cables, how they store and repair cables, and how they recover undersea cables to repair them. Apparently much more cable has been laid than can be used, and what is there is now only 10% utilized. As a result, several cable companies have recently gone bankrupt. 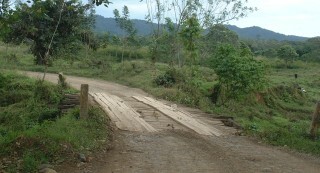 We found out in western Fiji that only the main road around Viti Levu is paved. On the south shore, this road is called the Queen's Road, and the Kings Road goes around the northern side. Just north of Suva we found that the Kings Road is not finished, and about 40 miles (70 km) of it is unpaved. This made for an interesting trip when we took the "scenic route" to get Emilia to the airport - very rural and scenic, but strange that we were on the (dirt) main road just north of Suva.